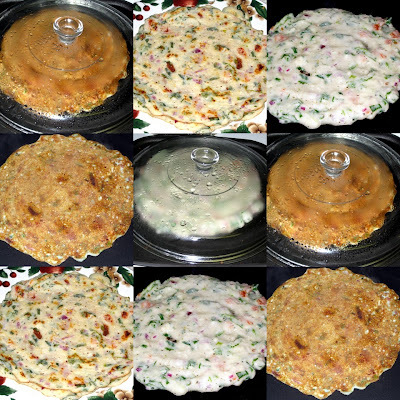 All About Konkan: Veggie Utthapa or Mixed veggie dosa my style..
Ofcourse, this is not the original way Utthapam/Utthapa is made. But I had some Idli batter made with Idli-rava, and wanted to eat something nice without having to steam the idlis and at the same time, make my son eat something with veggies in it also. So, just added a few veggies to the batter and made the thick dosas ( I called them Uttapam :) ). Red onions, tomatoes, spinach, cilantro, green chillies and grated cauliflower. You could add grated carrots or any other vegetables also. Add little salt and mix all well. Spread the batter on a heated tawa to form a thick round dosa. Drizzle oil on the sides and little on top of the dosa. Cover it and cook one side. Then flip the dosa over and cover and cook on other side. 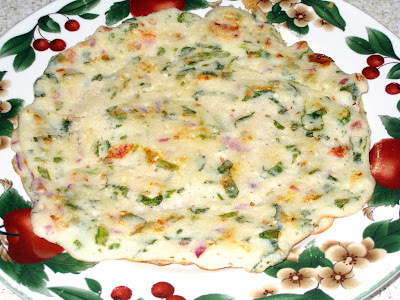 The result was delicious and a filling dosa or uttapam or whatever you would like to call it. This goes out to Srivalli at Cooking4allseasons, who is hosting the DOSA MELA. Thanx for hosting such a wonderful event Srivalli. Maya's veg-pancake/ veggie-uttaph! Too nice, wd surely click wt kids..must try - the collage truly looks pretty - loved ur adap-ie glass lid! Maya, also thanks for your lovely tip on choco chips to b kept in a tsp of flour, it worked this time i baked muffins!! They didnt settle at base but got beatifully adjusted frm top to bottom! Thanks, yaar! Maya..that looks very yummy...you can send this to my dosa mela! Veggie Uthapam looks great. grated cauliflower is a great idea to sneak in. I am going to try that next time. I liked that collage. We make uttappams at home with idli batter regularly not with dosa batter like it is normally done. That comes as handy for non-idli liker like me. Maya - even I like making uttapams with idli batter. they taste delish .. infact better than the original dosa batter..what say?